Allen's compact 3-N-1 Archery Tool fits in the palm of your hand and is a broadhead wrench, blade locking wrench, and a nock wrench all in one. The broadhead wrench helps save your fingers from cuts, and fits any 2, 3, or 4 blade broadhead. The blade locking wrench can be used with any broadhead with a 4-notch key pattern on its collar, and the nock wrench fits many common nocks. Allen&apos;s compact 3-N-1 Archery Tool fits in the palm of your hand and is a broadhead wrench, blade locking wrench, and a nock wrench all in one. The broadhead wrench helps save your fingers from cuts, and fits any 2, 3, or 4 blade broadhead. The blade locking wrench can be used with any broadhead with a 4-notch key pattern on its collar, and the nock wrench fits many common nocks. 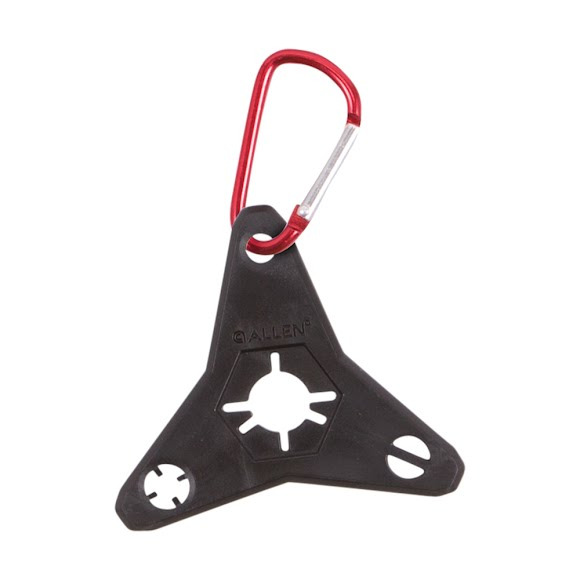 Light and compact, this multi-tool also comes with a mini carabiner, so you can attach it to your belt loop, your pack, or onto many blinds.